Tom Sulczynski made his flight – though in fairness, it was delayed for four hours. Sulczynski was driving that red GMC that became an icon of Friday’s earthquake in Anchorage – it ended up stranded on an island of pavement on an offramp that collapsed all around it. Sulczynski left Homer, where he works in information technology, early Friday morning. The four-hour drive meant that he and his girlfriend were pulling off Minnesota Drive and onto International Airport Road at exactly 8:29 a.m.
Sulczynski said he’s “not always, like, the punctual guy,” so he was excited to be arriving at the airport with plenty of time to spare. “Being here early, I was so excited – I was like, ‘I finally did things right,’” Sulczynski said. And then the magnitude 7.0 earthquake started. By that point, Sulczynski said, he’d slowed down to the point where it wasn’t hard for him to stop before he reached the edge of the road. There was still enough connected pavement that he and his girlfriend could walk away. And a driver who’d been behind them on the offramp offered a ride to the airport, where Sulczynski said he enjoyed some minor fame. Sulczynski said his car was towed soon after the earthquake by a local company, Vulcan Towing. A woman at the company declined to comment Saturday, but Mahear Aboueid, a state transportation department worker who saw Sulczynski’s GMC being towed away, said Vulcan got it out with the help of some foam ramps. “They strapped on a cable and brought it in,” Aboueid said. The cause of the offramp’s collapse stemmed from the ground underneath being saturated with water, Aboueid said. During the earthquake, “liquefaction occurred,” he said, and the bottom of the offramp spread out. The rest of it followed. 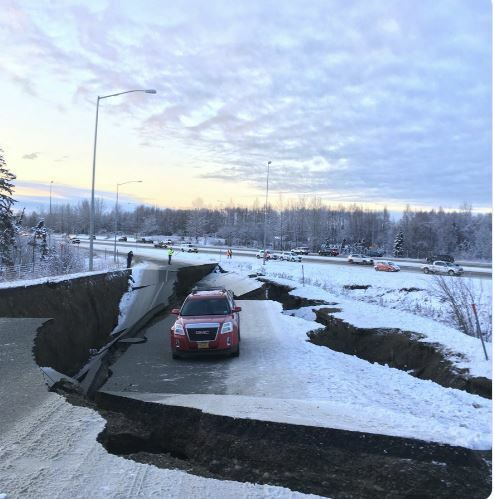 Aboueid said the offramp was probably the most heavily damaged stretch of road in the Anchorage bowl – though there was also serious damage to the Glenn Highway leading north from town, as well as to roads in the Mat-Su. The transportation department hopes to reopen the offramp Monday night, Aboueid said. As for Sulczynski, he was in Seattle on Saturday, helping his girlfriend clean out a storage unit, then heading to California to visit family. He said he won’t know until Monday if he’ll have to pay for the tow.